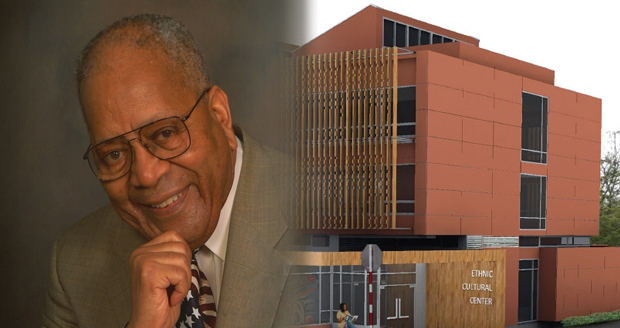 The University of Washington Office of Minority Affairs and Diversity’s (OMA&D) new Ethnic Cultural Center (ECC) will be named in honor of the late Dr. Samuel E. Kelly, the founding vice president for the department and a pioneer for diversity on campus. The UW Board of Regents approved the naming of the center at its meeting on Jan. 12. Currently undergoing an extensive renovation, the new “Samuel E. Kelly Ethnic Cultural Center” is scheduled to open in late fall of 2012. Dr. Kelly came to the UW in 1970 and took on the role as the University’s first Vice President for Minority Affairs. By doing so, he became the first African-American senior administrator at UW. For six years, he led one of the strongest programs in the nation dedicated to integrating students of color at a major university. The innovative programs he developed over 40 years ago to recruit and retain underrepresented and economically disadvantaged students continue to this day. Dr. Kelly was also a special assistant to the president at UW from 1976-1982. Prior to his tenure at UW, Dr. Kelly served in the U.S. Army for 22 years (1944-1966), rising from the rank of private to colonel. He was the first African-American hired in the Washington State Community College System when he began teaching at Everett Community College in 1964. Dr. Kelly also taught and held administrative positions at Shoreline Community College (1967-1970). After retiring from the UW, Dr. Kelly played a large role in revitalizing the Rosemary Anderson Middle and High School, an alternative school in Portland, Ore., that served inner-city students who were unsuccessful in traditional public schools. He helped with the school’s organization and administration, in addition to teaching classes, for 13 years. Since 2005, OMA&D has hosted a faculty lecture series to honor Dr. Kelly that showcases nationally recognized research focusing on diversity and social justice. He attended every lecture until his death in 2009. Dr. Kelly penned an assisted autobiography with UW history professor Quintard Taylor that was published by the UW Press in 2010, titled Dr. Sam: Soldier, Educator, Advocate, Friend. The Samuel E. Kelly Ethnic Cultural Center provides a learning environment where students and student organizations collaborate, develop, and implement programs while building leadership and organizational skills. It currently serves approximately 70 student groups and has been a “home away from home” for students of color since its inception in 1971. The original building was demolished last fall and a groundbreaking for the new facility took place on Oct. 12, 2011. A public reception and facility tour are being planned for the grand re-opening. An online photo gallery of the event is available here.